Mike had the unusual idea of keeping what he was demonstrating a secret and inviting the audience to guess what he was making as the evening progressed by writing it on a card. The first correct guess would win a prize of some laburnum. There was a condition, though. The wood would have to be used to make something for the members’ gallery. He started by turning a cylinder between centres with a spigot on each end and parting it off at about 2/3 along. “Ah, a box”, went the murmurings and a few cards came forward. But then he turned a slightly thinner cylinder, mounted it in a chuck and stepped it with a 40 mm diameter at the chuck end and a 9 mm spindle at the other. The 40 mm part was undercut where it joined the spindle. Mike dropped a clue at this point referring to this part as a piston. A flurry of cards and the suggestions became wilder. 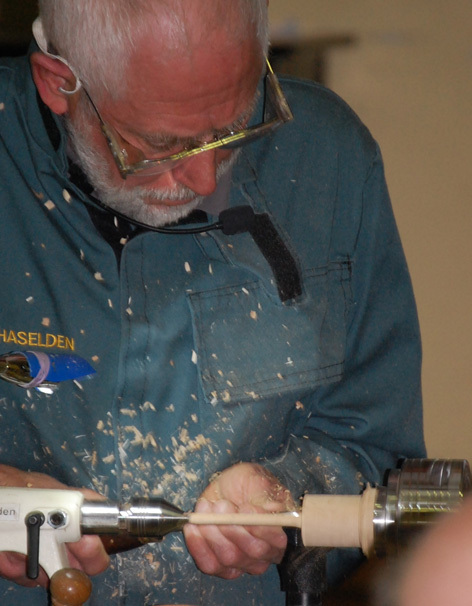 The larger part of the divided cylinder was re-mounted and a 40 mm hole bored with a Forstner bit and sanded to accept the piston with a sliding fit. . Mike uses a holder for the sanding. “Never put your fingers inside if you can’t get your fist in” he advised. The smaller part of the divided cylinder was then mounted and a 40 mm spigot turned on the end. A 9mm hole was drilled in this. A reference to this part as the handle was another clue. The bored cylinder was re-mounted and the “handle” jammed on to it, supported by the tailstock. 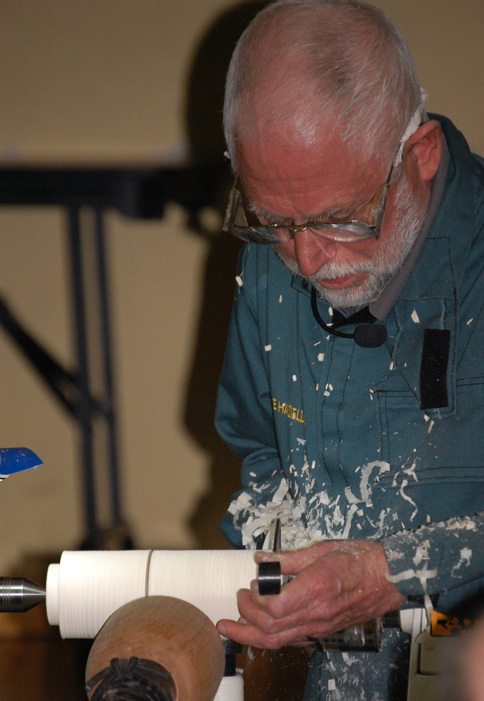 The joined cylinders were turned to a tapered shape and a handle turned at the end after covering the join with masking tape and removing the tailstock. Time was pressing and Mike had to resort to that tried and tested trick of revealing one he had finished earlier. Just before that, however, that wily gambler, Denis Hilditch had been biding his time before handing in his suggestion. 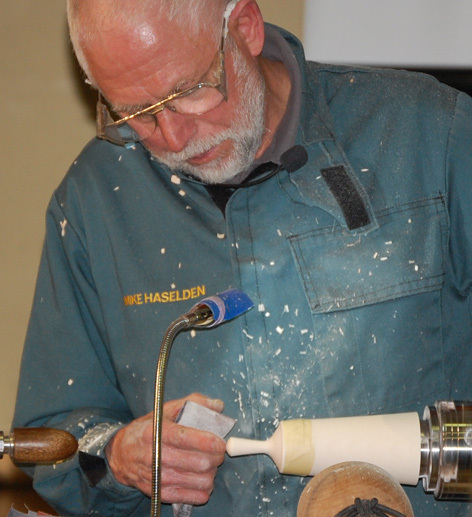 Mike demonstrated the function of his creation by standing it upright and lifting the handle. 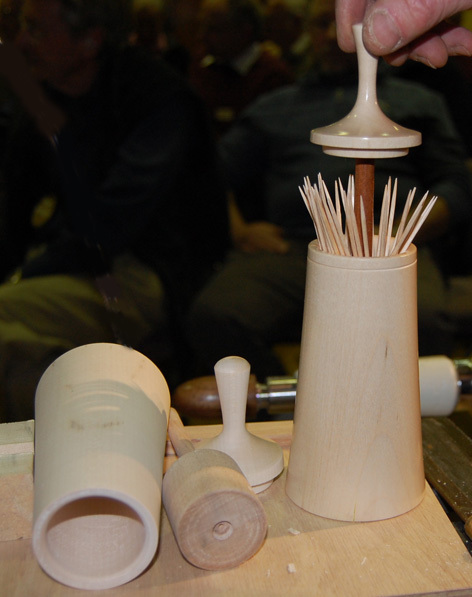 An array of cocktail sticks splayed from the opening join where they could be picked out individually. Scrutiny of the suggestion cards revealed only 1 correct guess, that last entry from Denis. Denis called it a toothpick dispenser. Mike intended it for cocktail sticks but we thought he was being picky and the prize went to Denis. I rather lost track of the function of a small plug and a piece of string (presumably to prevent enthusiastic pickers from pulling the top right off, spilling the sticks?). How about writing it up as a project for the “turn yourself” page on the website, Mike? Jean Turner kindly said a few words about the things on the members’ gallery. Pictures of all of them can be seen on the website. The gallery always creates a lot of interest; thanks to everyone who brings their work in.